You want to find a great business idea? Then look for a problem that is so painful that people cobbled together an interim solution. I have tried this for my second weekly startup and actually found an interim solution for a problem: A lot of mothers post on forums to find other mothers in their neighborhood to do joint activities. Once again: They post it on forums! Come on, that’s like looking for a new partner at Craigslist! I thought, there must be a better solution for that. Here’s the whole story of “Meet-a-Mom”. If you want to read the summary first, here you will find it. All right: The King is dead, long live the King! 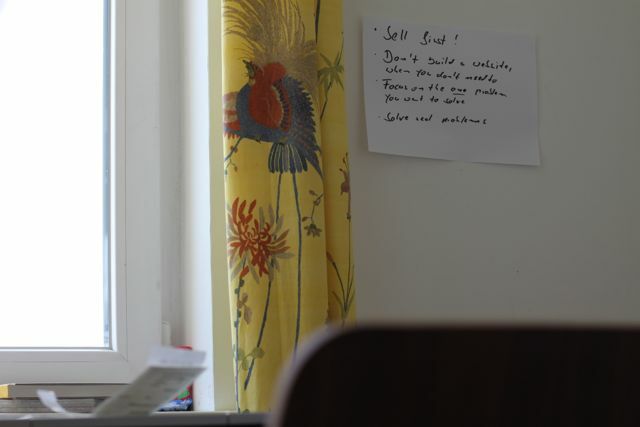 I pinned the learnings from my last startup Sharevent on my wall and kicked off. Let’s see what will happen this week. Do you really need a business model? Last week’s startup Sharevent I started with already having a business model in my mind. Somehow I got the feeling that this wasn’t the best way to launch a startup. I know it sounds naive, but perhaps it is better, to think about a solution for a real problem first, and then start to think about monetization later. For example: When I worked on Sharevent, I realized during the week, that my business model probably wasn’t the best – but I wasn’t willing to give it up, either. In retrospect I think, that Sharevent would have been more successful, if I got users to my site first and then tried to find out, what they are willing to pay for. Conclusion: Let’s start a startup without having any idea about the business model. That’s gonna be fun. I started the week by looking for a new business idea. This time I wanted to use a concept from the wonderful book The Startup Owner’s Manual by Steve Blank and Bob Dorf to discover a new market. Steve Blank and Bob Dorf describe in their book the so-called earlyvangelists. Earlyvangelists are „customers who commit to buying a company’s product before there is a full product available and spread the news of the product to friends, family, or coworkers.“. They are the most important customers of all. When you found earlyvangelist, you probably found an interesting market. 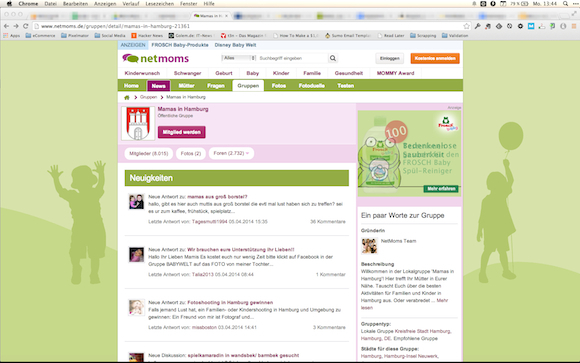 This is the German forum „Netmoms“. It is basically a forum for moms. What you can see in this screenshot is the sub-forum for the city I live in: Hamburg, Germany. Like I already described in my last startup, I like to start business locally – it makes many things easier. There are mothers looking desperately for other mothers to start joint activities, like having a walk. They understand they have a problem: Yes – otherwise they wouldn’t post on forums. They’re actively searching for a solution and have a timetable for finding it: Yes, they are actively searching for a solution in the forums. I don’t know if they have a timetable for this. The problem is so painful that they’ve cobbled together an interim solution: Yes, and I think that’s the most important part. These mothers use a forum to find other moms. Again: A forum! Come on, their must be a better way to find other mothers – like a dating site for mothers. They’ve committed, or can quickly acquire, budget dollars to purchase: Don’t know, but I don’t want to think about the business model, yet – bad idea? We will see. Okay, let’s start a new startup: Meet-a-Mom (sounds a little bit sleazy in Englisch – actually I called it „Mamatreff“ in German. But I will use Meet-a-Mom throughout this blog post). My last week’s startup failed, because I did a poor job at defining the most important problem of my customers. For Meet-a-Mom I wanted to do better. Therefore I decided to use this day to do some research on the customers. Forums are GREAT places for research. People talk relatively open about their problems. 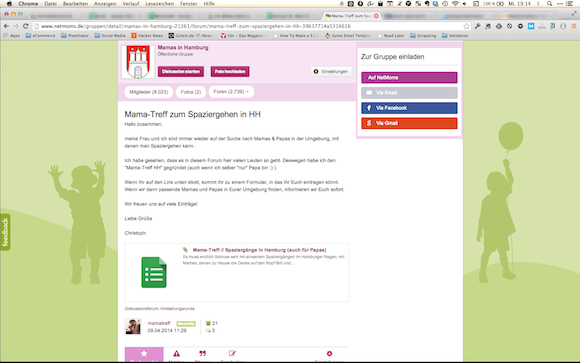 Therefore I started to search for forums, where moms from Hamburg exchange their experiences. The best way to find forums for specific topics is to use the Google Search Term „inurl: forum“. 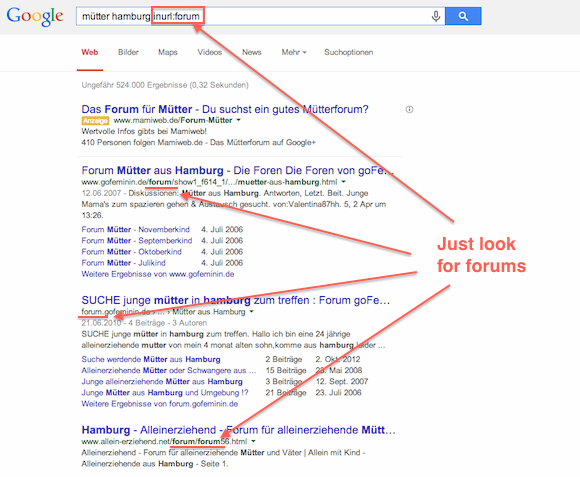 By using it Google just gives you back the results, where the word „forum“ is in the URL. I used this technique to find 12 forums for mothers from Hamburg. 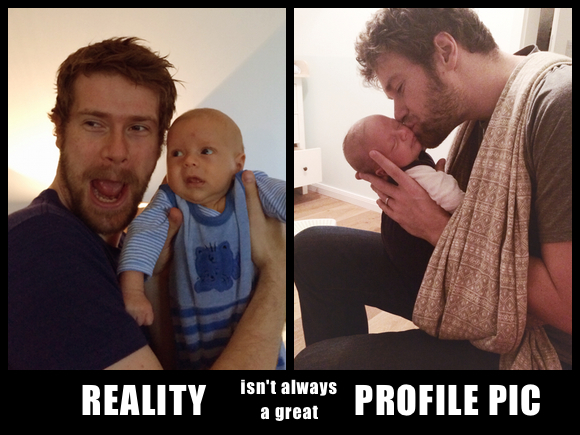 I signed up for each of them, with a romantic baby picture (yeah, it’s the one on the right side ). When you use forums for research it is actually quite important to have a nice profile picture. People like to know with whom they interact – and they like to interact with people who seem likeable. All right, let’s start the research. 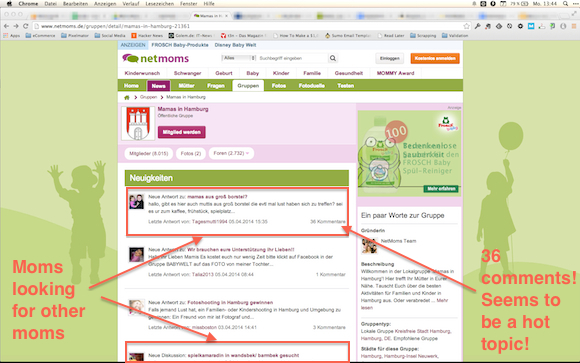 First I searched through all the different forums to find mothers from Hamburg, who are looking for other moms. I wrote down the URL of each post, to return to it later. 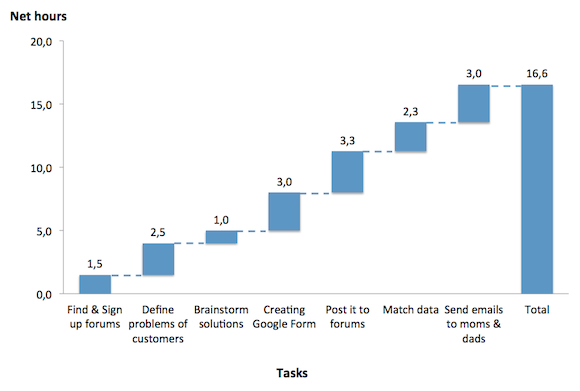 Define customer problems: Define the customer problems as good as possible. This makes it easier for you to solve them. It was the first time I used Google Form and I was pleasantly surprised! I used it to build a „website“, which I additionally linked to a Google Spreadsheet. Therefore I could easily save the data from the form. Everything just took me 3 hours to set up – not bad for a website with a working database in the backend. 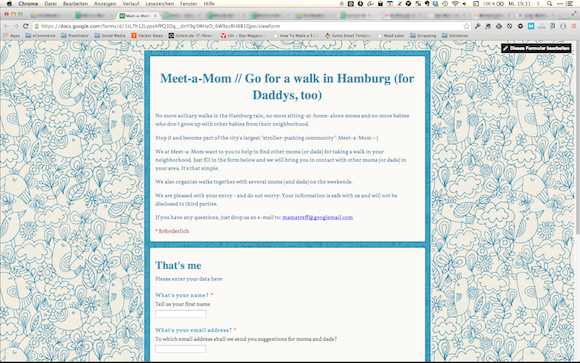 And this was the result: Check out my fancy Meet-a-Mom website. With the website I tried to focus on the one problem „I am a mom and I don’t find other moms, who want to have a walk with me and my child“. I was tempted to build something bigger out of it (like „Let’s build the biggest mom community in Hamburg“), but I tried to follow my learning from the last startup: Focus on the one problem you want to solve. With the website I had the possibility to get the data from the mothers. But how should I manage the „matching-process“ for the different moms? Google Form doesn’t offer any logic like “Find a mother B which fits to the criteria of mother A and vice versa”. I decided to do it manually with Excel and email . I just wanted to take the data of the moms and match the „I am looking for“ part and the „That’s me“ part. When I found a matching pair, I would contact both mothers by email. I agree: Not a very good user experience. my wife and I are always looking for moms & dads in the area, with whom we can have a walk together. I have seen that many people here in this forum have the same problem. That’s why I founded Meet-a-Mom (even though I am just a dad). If you click on the link below, you will get to the Meet-a-Mom form where you can sign in. If we find matching moms and dads in your area, we will inform you immediately. We look forward to many signups! I posted for 3 hours and I just thought: „This will NEVER work out!” – let’s wait for tomorrow. Google Form works as a website: Yes, you can use Google Form as a very basic website. It has a front-end (a form) and back-end (a spreadsheet). Very nice! I opened my Macbook, and I couldn’t believe it: 30 people signed up for Meet-a-Mom within 12 hours. I expected 10 – 15, but not 30! Okay, let’s try to make some money! Okay, I had 30 potential customers, but still no business model. Let’s change that. First I divided the potential customers into two groups: The matching moms (moms, for whom I could find a matching mom) and the non-matching moms (moms, for whom I couldn’t find a matching mom). Walk-in-the-park: For 10 Euros (approx. 14 Dollars) they could have a walk with other parents in a big park here in Hamburg, while I would bring coffee and some cake. These is the email I used for the Children-City-Guide. Subject: Meet-a-Mom: We just found 2 moms, who fits perfect to you! Thank you for signing up to Meet-a-Mom . We’ve just found 2 moms in your area, who would fit perfect to you: Natasha and Herta. If you want us to make contact with Natasha and Herta, please answer briefly to this e -mail. In the districts of Bramfeld, Barmbek-Nord and Wandsbek we offer so-called children-city-guides. The children-city-guide shows you on a walk all the important spots in your district (where are the best pediatricians, where are the best playgrounds, where are the best kindergartens) and give you tips and tricks for your neighborhood. A children-city-guide walks with up to 4 people and costs 50, – Euro per tour. Costs can be split between course participants. For 4 people the cost would be 12.50 euros per person. Is a children-city-guide interesting for you? I am really excited about how many moms & dads will answer. Solve the problem just a little bit better: I NEVER expected so many people signing up for such a shabby looking solution like the Meet-a-Mom website, but 30 people did. This is a big learning for me: Start with a solution that solves the problem of the customer just a little bit better, than the existing solution. That’s enough. You can extend the solution later. Build an audience first and think about your business model later: This probably won’t work every time, but I think in many cases you should start your business with building an audience first and think about your business model later. Sometimes we tend to think so hard about the business model that we forget to listen to the customers – this won’t happen when you first start to build your audience. 101 email tricks: Use „You wanna read this email“ subjects. If you got the chance, write the email in such a way, that the reader has to answer it (e.g. hold back information). Be as specific as possible in your email, for example by referring to the area of the reader. The last day for my startup Meet-a-Mom started. And the big question is: Can I earn some money with the idea? 8 moms answered to my email. All of them asked for the contact of the matching mom, which I gave to them for free. One mom showed interest in the children-city-guide (hoooray!). She said she would book it, if she could find another two persons – pricing seems to be a problem. The good thing is: I know 2 moms in her area, therefore I made the contact and offered all three of them a special deal. Unfortunately I haven’t heard anything from them until now…doesn’t look good for me. Let’s face it: The conversion rate is way too low. It seems to me, that the moms really like the idea of Meet-a-Mom, but my extra-service doesn’t attract them. Obviously it doesn’t provide enough value to them. The conclusion for Meet-a-Mom: Grow or Go? Meet-a-Mom is a great idea, but it is also an idea where you can’t make any money. Therefore I won’t invest in this idea. 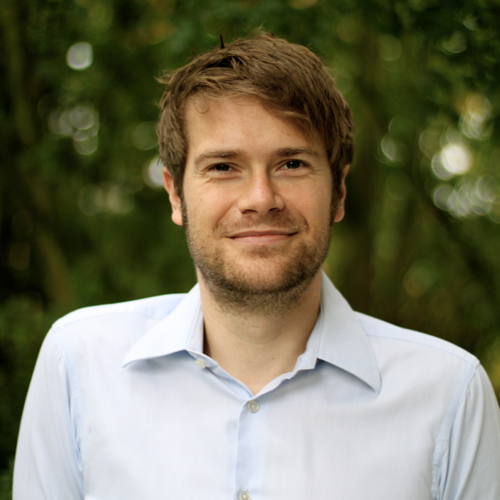 Go for global: The business model will just work on a big scale. Therefore you have to offer it worldwide. If you want: Try it! This was an interesting week. I never expected that so many people would sign up on the shabby looking Meet-a-Mom website. 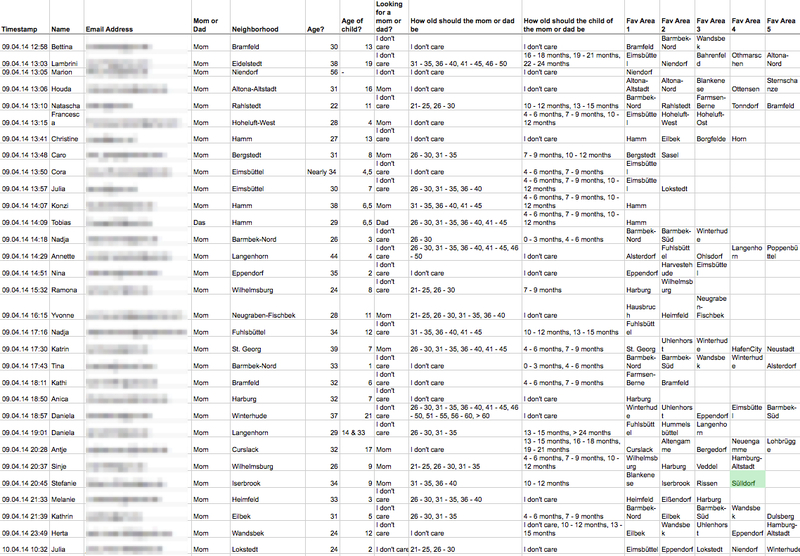 But without much effort I got 30 perfect datasets from moms & dads in Hamburg. That was a big surprise to me. On the other side I was very disappointed, that no one took any of my offers. Of course you can argue „Dude, you started your business without any business model! What have you expected?“, but after a week working on a Meet-a-Mom I can’t agree on that. From my point of view the method was good, but the idea was bad. I still think, that it’s sometimes a good idea to build your audience first and to think about your business model later. It is much easier to draw on a canvas than drawing on air. The main learning for me from Meet-a-Mom is this: When you have a solution for a problem, you should make money with the solution and not just with the extra service. Or to put it in another way: When you have a gas station, you should sell gas, not just cookies. My biggest mistake at Meet-a-Mom was to give away the solution for free (you get all the contacts to moms & dads nearby) and trying to make money with an extra-service, which solves a complete other problem. Elevator pitch: The startup idea in one sentence Meet-a-Mom: We help moms & dads to find other moms & dads in their area for joint walks. How much money did I make and where did it come from? Zero – that hurts! What decision did I make after one week? Grow or go? I decided to stop Meet-a-Mom. No money, no funding. When you got a gas station, sell gas, not just cookies: When you have a solution for a problem, you should take money for the solution and not just for the extra service. The extra service probably won’t solve the problem of the customers and is therefore not valuable for them. At the next startup, I will charge the customer for the solution and don’t invent an extra service. Find problems with poor interim solutions: Look out for problems that are so painful that some people cobbled together an interim solution. These people are probably great earlyvangelist, who are your most important customers. At the next startup I will try to find problems with poor interim solutions again. Build your audience first: Sometimes it is helpful to build your audience first, and think about the business model later. This gives you a broader scope and a higher momentum. I am not 100% sure if this learning is valid, but I want to keep it in mind for my next startups. Well, that’s it! I hope you enjoyed it. If you want to read about my next startup, visit me next week or sign up for my newsletter and get it delivered directly to your inbox. Please feel free to comment on my second startup Meet-a-Mom in the comment section right below. die Darstellung des Entwicklungsprozesses von “Meet-a-Mum” ist sehr praxisorientiert und die empfohlenen Umsetzungstools nützlich. Deiner Schlussfolgerung kann ich mich diesmal allerdings nicht komplett anschließen. Im Gegensatz zu Dir glaube ich, das funktionierende Services genau so wichtig sind, wie die CORE-Leistung. Die CORE-Leistung im vorliegenden Fall, wird im Falle eines Erfolgs, schnell COPYcats zum Opfer fallen, weil er schwer zu verteidigen ist. Die dauerhafte Verteidigungsposition kann nach meiner Auffasung nur durch schwer kopierbare Serviceangebote gewährleistet werden. Ich denke, das man hier die Flinte, beim ertasten der “oekonomisierbaren Services” nicht so schnell ins Korn werfen darf. Eine Formulierung von alternativen Services, noch enger am CORE, kann mit vertretbarem Aufwand den Durchbruch bringen. thanks for the amazing comment!!! This gives me the opportunity to make one thing clear. I agree on your opinion that the core-value AND the service are important for a product/ company. What I found out at Meet-a-Mom wasn’t that you should dismiss extra-services; what I found out is, that when you have a solution for a problem, you shouldn’t use it just to get “traffic”/”customers” for your extra-services. People need the solution and the goal is too find out, who you could make money with the solution, first. When you found it out, THEN you could start to sell the extra-service. Vielen Dank für den tollen Kommentar. Hat mir sehr geholfen noch einmal über das Thema nachzudenken. Was ich bei Meet-a-Mom rausgefunden habe ist nicht, dass (Extra-)Services keinen Sinn machen. Das tun sie natürlich – auch genau in dem Sinne, wie Du es beschrieben hast. Es macht halt nur keinen Sinn, eine Lösung für ein Problem anzubieten, für diese kein Geld zu nehmen und zu versuchen nur mit zusätzlichen Service Geld zu machen. Da ist es, meiner Meinung nach, schlauer, erst einmal zu versuchen mit der eigentlich Lösung Geld zu machen und dann später die Extraservices einzuführen. Good work Chris! This will help me in my future thinking about business. Very helpful. Thanks Martin! Great to hear, that it was helpful for you! Very neat blog post. Keep the posts coming! Thanks Nick! Greetings to Berlin! Great post again! I admire your guts for starting something without a business plan. Personally I find it very difficult to come up with ideas without already thinking about the business model, even though the business model could be something simple like selling ads. The topic is hard for me to relate to since I don’t have kids, but I can see this being a problem for other groups of people as well. I know that there are also some apps that try to connect people with similar needs (/problems). Have a nice rest this weekend and good luck with the next startup! great to hear from you again!!! Thanks for your kind words and your feedback. I think that you could take concerns of parents and write great educational content and get subscribers with optin page. Concerns of parents can be taken from customers interviews. Great content is important as if it provides a lot of value it can be shared with another members. Build relationships and after organize events (for example pediators,educators, nutritions, activities for kids, book promotions, promotion events for kids, developing games ,etc. for payment). Create a network of parents , also could be used webinars to get traffic . Here can be applied subscriptions model. All hypotheses of course should be tested. that’s a interesting, different view on Meet-a-Mom: Use it as a starting point for a long (actually, veeeeery long) customer journey. Love that! Great thoughts in your comment – thanks a lot! thank you again for antoher great post! I am looking forward to reading about your next startup. I liked the “finding problems with poor interim solutions” approach. Instead of trying to create a market, just focus on solving a problem, where you know that people need your solution. I will definitely use this approach in future. thanks for your nice feedback! Glad I could help you. Great post here, congratulations on your hard work. I have a question: Let us say that you decided to try to charge for the sign up or fremium models. How do you actually charge? I’m guessing setting up an online payment can be both time and money consuming. Do you just ask for a transfer? Paypal? Ask the user how she wants to pay? I have a question: Let us say that you decided to try to charge for the sign up or fremium models. How would you actually charge? I’m guessing setting up an online payment can be both time and money consuming. Do you just ask for a transfer? Paypal? Ask the user how she wants to pay? Concerning your questions: I would go for Paypal – very simple and good for doing the basic stuff! I just found this page looking up “Startup for Moms” in google. This detailed explanation of what you did in starting your business, definitely helped me in how I could start looking at business planning, and bringing a business idea from idea to fruition. Definitely a great article, definitely going to bookmark it. thank you so much for your comment! I am really glad, that my article helped you and your business! That’s what this is blog is for. I wish you all the best for your business!